Rich Robinson is back with another corvid inspired band under his wing The Magpie Salute. Born out of The Black Crowes with guitarist Marc Ford and bassist Sven Pipien joining him. The shine on the Magpie wing is further polished with the addition of vocalist John Hogg shared Hookah Brown with Robinson as keyboardist Matt Slocum and drummer Joe Magistro. 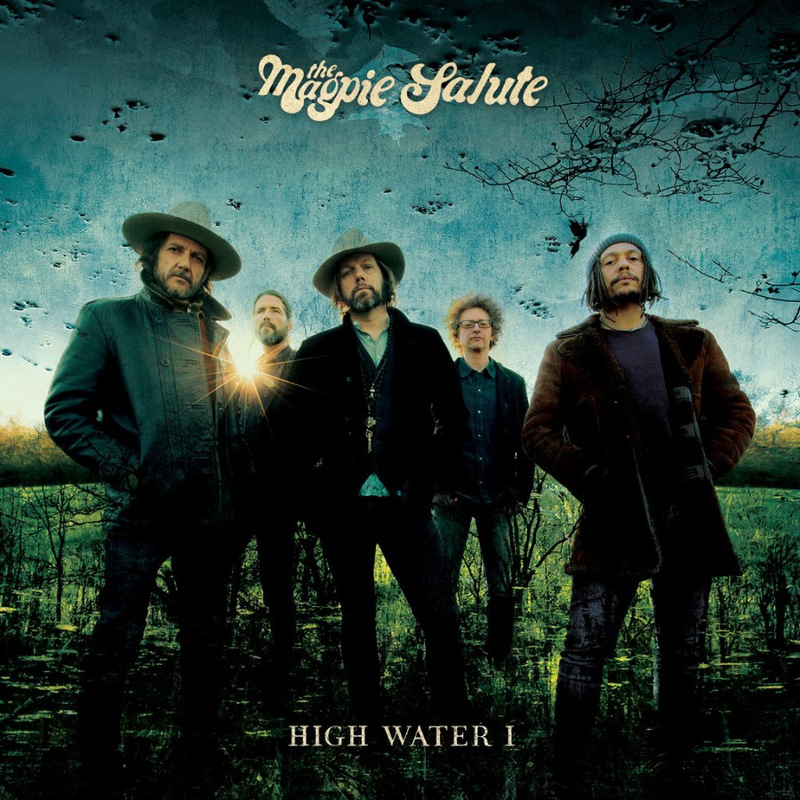 The Magpie Salute are demanding to be heard with debut album High Water 1 released 10th August on Mascot Label Group. The music continues with many original twists and turns. Liz at Bluesdoodles was delighted to have the opportunity to chat with Rich Robinson. BD: The Magpie Salute, will be a new name for many for others they will be excited to know that an album is in their grasp. How did The Magpie Salute come together? RR: All happened a couple of years ago when on tour in 2016. It wasn’t really planned, I had a show coming up in Woodstock with the opportunity to record live and that was the start in front of an audience of 100 people. I thought let’s play with musicians from over the years. We ended up playing three sold-out shows of two sets over three days. I appreciate when there is a connection with people when we play together. Marc Ford is definitely one of those guys, I said ‘Let’s do something cool and different’. Marc, said “I don’t care what it is I will be there”. So we had the beginning. Next, I reached out to Eddie Harsch, the late, keyboard player with the Black Crowes his response was the same, “I don’t care what it is I will be there”. With Joe Magistro on drums, John Hogg on vocals. We thought just play three shows and that would be it. We all felt something special something different. What are we going to call it? we didn’t know but it wasn’t finished. We played three more sold out shows in New York. BD: Having heard High Water 1 it is different from Black Crowes but the corvid link of Magpie and Crows are there it is within the family grouping that is the signature of your music. How do you see Magpie Salute differing from Black Crowes? RR: I am, we all are, so proud of what the Crowes accomplished. It was a huge swathe of my adult life a big accomplishment. Things change and there are other forces; it is important never to be limited and to find a way forward. The band is fresh whilst still in the family of Corvids. Marc & Sven are sons of the Crowes. John brings to his vocals a world perspective. Growing up in London, his Swedish/African descent brings something new and rather cool. I am pretty through and through an American but we think in a similar way. Drummer, Joe Magistero who drums with my solo band brings into the mix upstate New York sound. Magpie Salute, it is kind of new yet with a familiar sound. Not surprising as there is only a finite amount of chords and notes to play when creating music. What is cool is the number of younger kids coming out to see us live. The music is still valid not so pre-packaged. Listening to vinyl brings a whole new way of making music. Music has become part of our background relegated to the sound in our ears when walking down the street. We are bombarded with music. You have to respect the music when you have a process. With vinyl you open the album, it has a smell, large artwork. Then take the record out and place on a turntable and lift the needle, place on record then sit back and listed, with only 15-20 minutes each side you then get up and flip the record and repeat the in-depth listening process it is immersive. A lot of music consumed is easy come easy go. Music gives us a reason to dance, a truly human quantity. This is missing from today’s digital copy of reality a different reality awkward, cold, not truthful and also unhealthy. Perhaps it is healthier real emotion with real interaction. We experience the whole spectrum of living today. BD: The name Magpie Salute, is this a salute to the Crows or harking back to a British tradition of saluting a lone magpie. Not sure why I said harking back as I still salute a lonesome Magpie and say Good Morning Mr Magpie. RR: Salute the Magpie has three Black Crowes members we are not hiding that fact. Magpie Salute has three Black Crowes, like a rite of passage that lives in the name. Salute the Magpie, I come in peace. Good morning Cap’t, Magpie is part of the corvids part of the crow family it is a good away to make the transition. BD: The band half crowes. Yourself Marc & Sven what do keyboardist Matt Slocum, drummer Joe Magistro and vocalist John Hogg bring to the party? RR: John has an incredible voice, influenced by Rock n Roll, Sam Cook. He is incredible on Send Me and Omen and Sister Moon. John is a great musician known mostly as a singer, he also plays piano, guitar and drums. Anyone who can do that can get heard everywhere. BD: Do you have a favourite or track with special meaning on the album High Water 1? RR: Not really we are proud of the whole album. The record is a sealed once recorded and the songs have grown on tour the sound shifts and moves. As for a favourite song it is too early to tell. BD: Are you planning to tour with the album? If so will you be coming across to the UK? Yes, already touring the album. Playing acoustic sold out show in London and tour of UK is taking in eight cites and a festival.